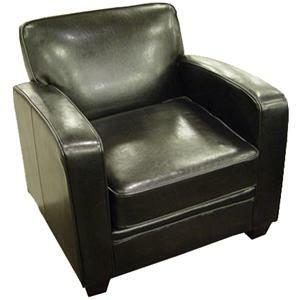 This reclining leather chair is sure to be a staple piece in your living room or family room. Plump cushions will keep you comfortable, with a built-in reclining feature that allows you to lean back and relax. Soft, rolled arms add comfort and support. 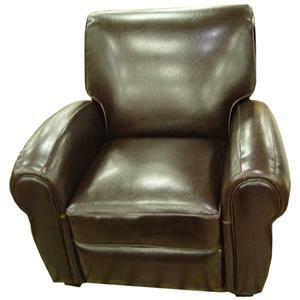 This traditional recliner chair is covered with quality top grain/split grain leather in a rich chocolate brown, for a look that will blend well with your decor. 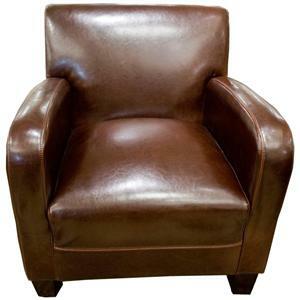 This stationary leather chair will update your living room or family room with modern style. It features sleek, contemporary track arms and tapered wood block feet. Plump seat and back cushions will keep you comfortable. Featuring quality top grain/split leather in a rich Cognac, this upholstered chair will create a warm, inviting atmosphere in your home. 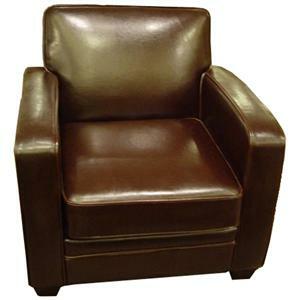 The sleek, contemporary style of this leather chair will add a modern accent to your living room or family room. Straight track arms and tapered wood block feet create a stylish design. Its plump box cushions complete the modern look. Beautifully upholstered in a rich chocolate brown and black leather, this chair will enhance your home with comfort and contemporary style.